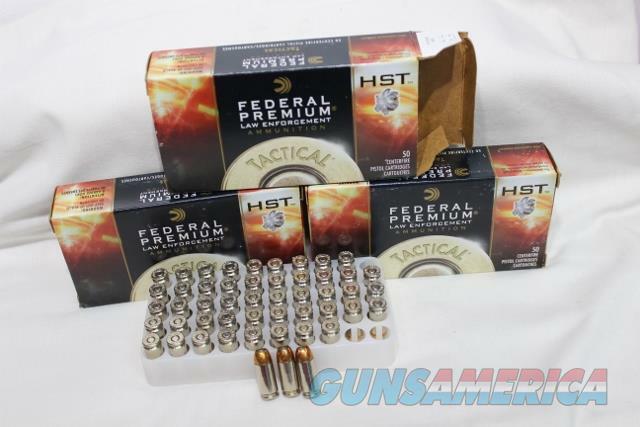 Description: Federal 40sw 155gr HST 50rds, this is for three boxes, 150rds, Specially designed hollow point expands reliably through a variety of barriers, Expanded diameter and weight retention produce the desired penetration for personal defense situations without over penetrating, Superior performance in FBI test protocol used by law enforcement officials to assess and select duty ammunition, Bullet nose profile, nickel-plated case and Federal’s unique primer provide the ultimate in function and reliability in semi-automatic handguns, must be 21 years or older, will not ship to states that ammo can't be shipped into, Price listed is a cash discount price. Credit cards add 3% to the total. This ammo will not ship to CA, MA, CT, MD, Washington DC, IL, NJ, CO, NY, AK, HI or any other place it is not legal or where the state has complicated ammunition laws. You are responsible for knowing if the ammunition is legal for you to own. You must be 21 years old to purchase. You will have to sign for the ammo. It will ship via UPS. The shipping is what it will actually cost for one box. We are a FFL, Florida residents add sales tax for your county, there is no local pick up and we do not have a retail store for you to come see the item. The price listed is a cash price; credit cards add 3% to the total. You can use the online checkout or call the shop with your information. We do not give out the reserve so please don’t ask, your email will be deleted with no answer. By committing to buy this item or gun you are saying that you are aware of all of the laws and restrictions in your state and you can lawfully own this item or gun.